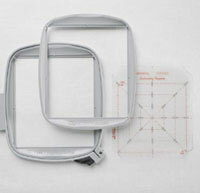 This new hoop with its quick release catch and choice of inner rings makes for simple hooping of thick fabrics. ALL machines will need a software update to use this new hoop and the embroidery unit of all but the Designer SE will need upgrading. A kit will be available for £24.34 plus fitting.